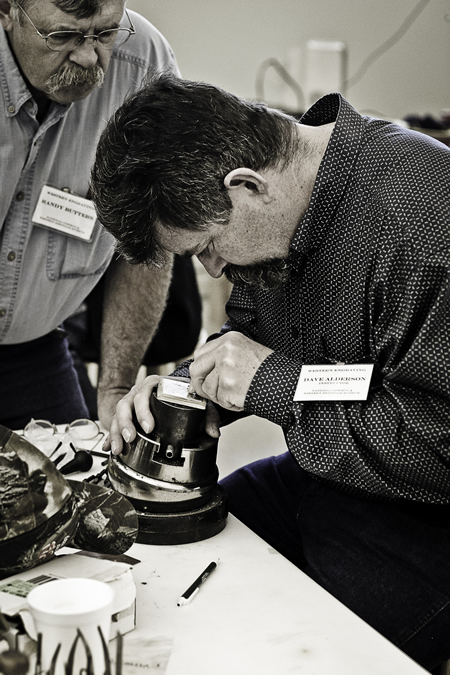 During a TCAA workshop, silversmith Dave Alderson demonstrates a scroll-design technique for veteran bit and spur maker Randy Butters, one of the workshop’s students. 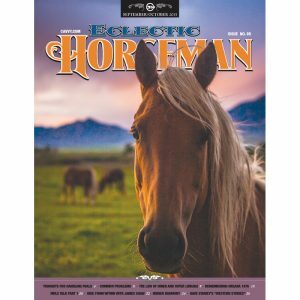 This article originally appeared in Eclectic Horseman Issue No.70. Editors note: Alderson has since resigned from the TCAA. Inside Dave Alderson’s silversmithing shop, located on the rural outskirts of Twin Falls, Idaho, workbenches and machinery occupy nearly every square foot of floor space. Narrow pathways wind among workstations and imposing industrial presses. It’s an orderly arrangement, one somehow made clinical by an abundance of natural light, but standing room is at a premium. Despite the close quarters, two students, silversmiths visiting from Australia, hover closely around Alderson as he works with a belt buckle in its earliest stages of development. They watch as Alderson repeatedly heats and presses the undecorated rectangle of solid silver. Each effort brings a small measure of progress as the buckle begins to take on the size and shape Alderson has in mind. Alderson begins a scroll on a blank piece of silver. 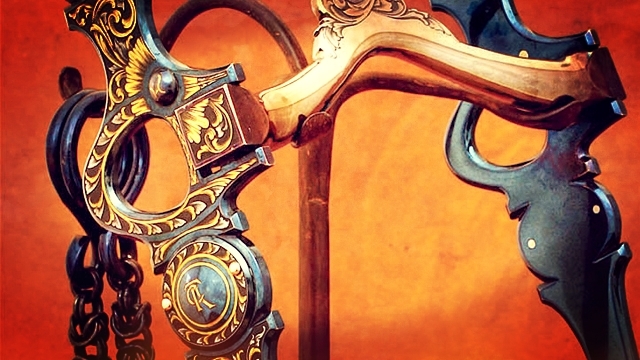 The silversmith learned the fundamentals of metal ornamentation by studying firearms-engraving techniques. 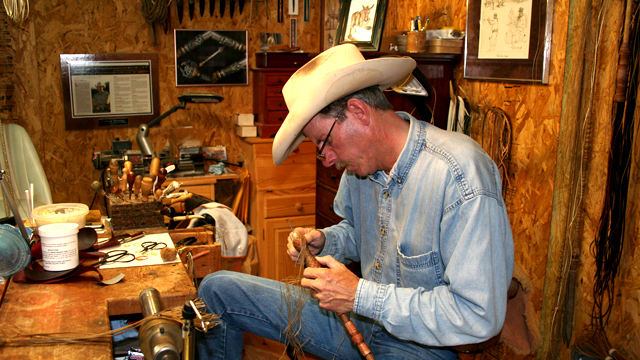 Alderson provides a running commentary as he works, offering details on proper technique, and what can be expected further into the process of fabricating the buckle. 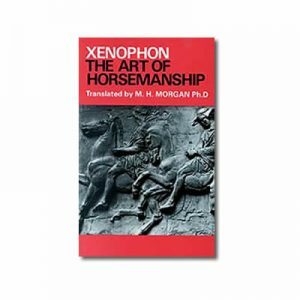 His students listen intently, furiously scribbling lines in spiral-bound notebooks quickly filling with technical specs, metallurgical theory, and guidelines for manipulating and decorating precious metals. It’s a hunger Alderson knows well, an insatiable intellectual curiosity that he contends is the only proven strategy to meaningful progression as an artist. It’s also a brand of ambition that continues to define his career, even with his growing stature as one of the West’s most influential silversmiths. Alderson’s fascination with precious metals began during his boyhood in the Black Hills of South Dakota, where he spent his summers panning for gold. 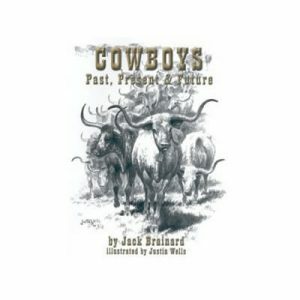 He struck up a friendship with a visiting silversmith who sold jewelry to tourists wanting souvenirs of their visits to the cowboy country of the Northern Plains. Silver had properties that sparked Alderson’s creativity. While still in his teens, Alderson moved to Central California. 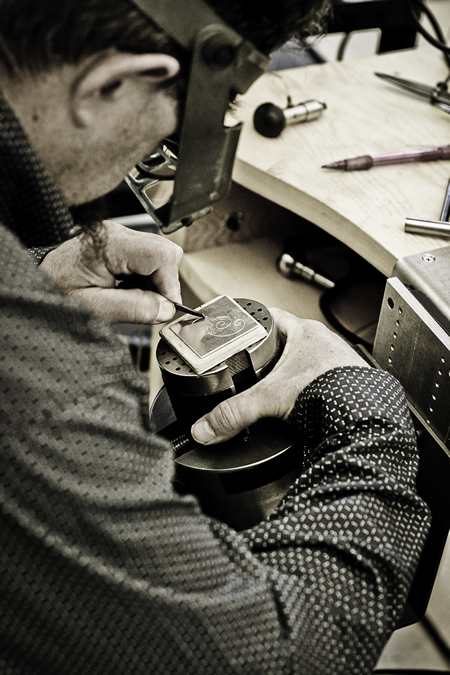 After high school, he went to work for his uncle, saddlemaker Don Moe, who taught the budding craftsman the fundamentals of engraving and introduced him to the influential West Coast bit and spur maker Bill Wimmer. 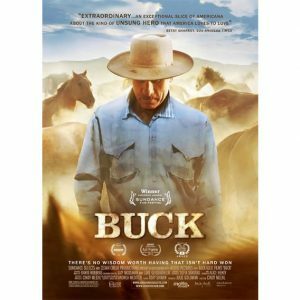 The veteran buckaroo had begun making “using gear” in the 1920s, and his work was prized by both cowboys and collectors. 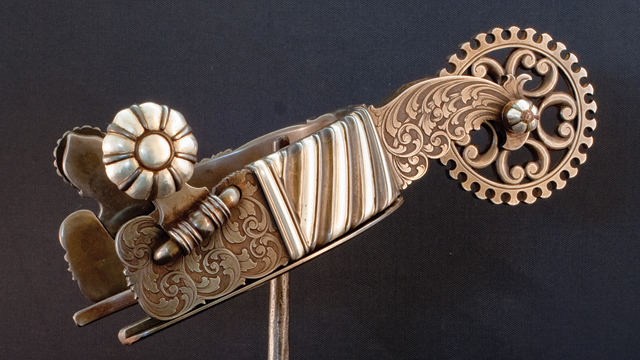 Under Wimmer’s guidance, Alderson crafted and engraved his first conchos. His work eventually caught the attention of Templeton, California, silversmith Gordon Hayes. Though Alderson turned out work under the names of his employers, his reputation grew among industry insiders. When Fran Harry passed away, Alderson inherited much of the late artisan’s engraving workload for San Francisco silversmith Robert Schaezlein. At regular intervals, Schaezlein sent a “box of work” to Alderson. Each shipment included an unpredictable mix of piecework that might include buckles, saddle silver and jewelry. Alderson continued to hone his talents for improvisation and problem-solving as he developed his skills at bright-cut engraving, a decorative style for which Schaezlein pieces were known. The experience gave Alderson the confidence to begin, by the late 1980s, creating work under his own name. 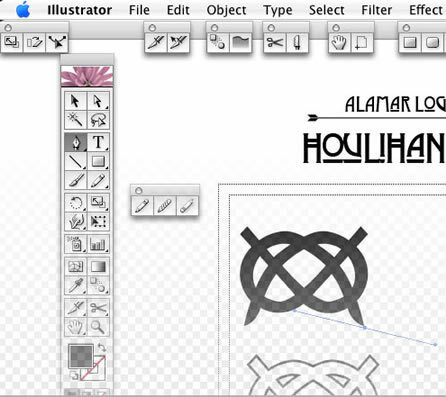 Developing his own style, though, presented challenges. “When I learned to engrave,” Alderson says, “no one explained what a scroll represented, or why a flower looked the way it did. I just did what I was shown and didn’t understand what I was doing. 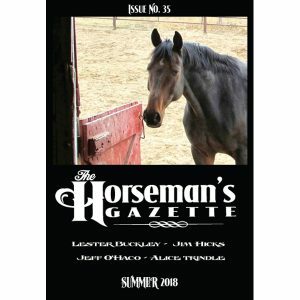 That bothered me.” Alderson enrolled in a gun-engraving class at Lassen Community College in Susanville, California, hoping to gain the fundamentals he knew he lacked. 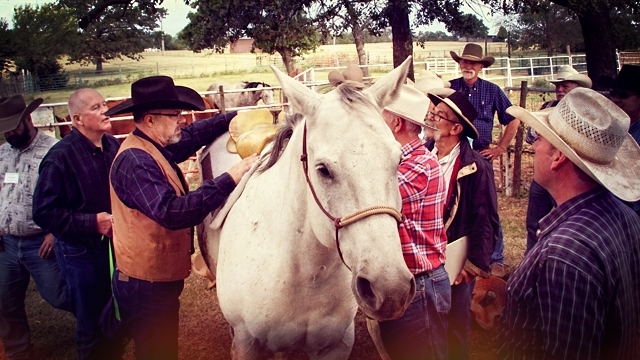 Alderson became a member of the Traditional Cowboy Arts Association in 2002. TCAA was formed to promote and preserve the crafts of saddlemaking, rawhide braiding, bit and spur making, and western silversmithing. Members conduct educational workshops for craftsmen, and showcase their own work at an annual exhibition held each fall at Oklahoma City’s National Cowboy & Western Heritage Museum. Through fellow TCAA members Armando Deferrari and Pablo Lozano, both Argentine rawhide braiders, Alderson was invited to spend a month in Argentina, studying the techniques of the country’s abundant population of silversmiths. 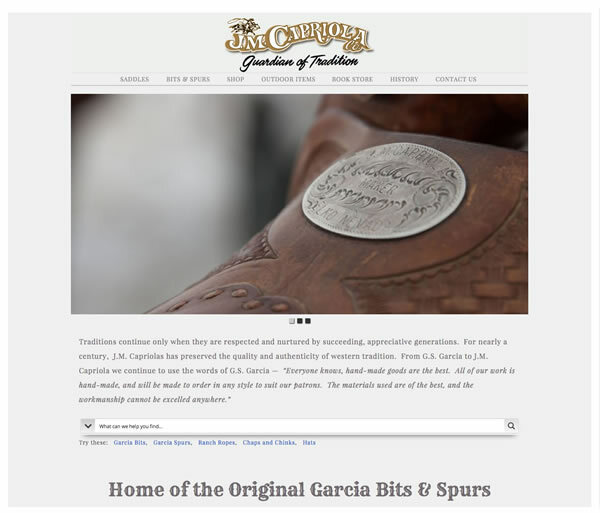 While in the gaucho-centric Argentine village of San Antonio de Areco, Alderson noticed a solid silver headstall and reins, fabricated from braided silver thread, hanging on the wall of a silversmith’s shop. It was work he hadn’t thought possible to create. 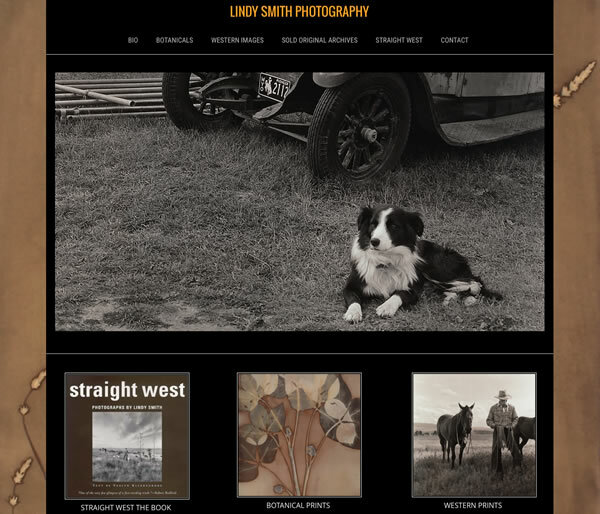 Down the street, in another silver shop, he saw a similar piece—again, a solid silver headstall and set of reins—on a bench. 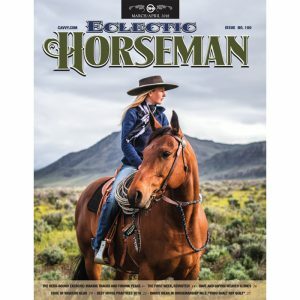 Back home in Idaho, Alderson built his own prototype, a piece he says was “over the top, but educational,” then followed up with a more understated effort—a leather headstall with braided silver cheekpieces and a sliding earpiece of braided silver. Each effort required dozens of hours, and involved fashioning fine thread out of melted silver. 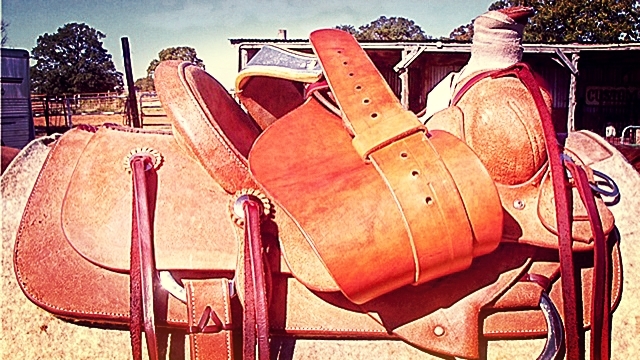 The results, though, represented a rare addition to the landscape of cowboy craft, an introduction of unfamiliar techniques that still produced a recognizable, traditional product. It’s a level of originality every craftsman aspires to achieve. 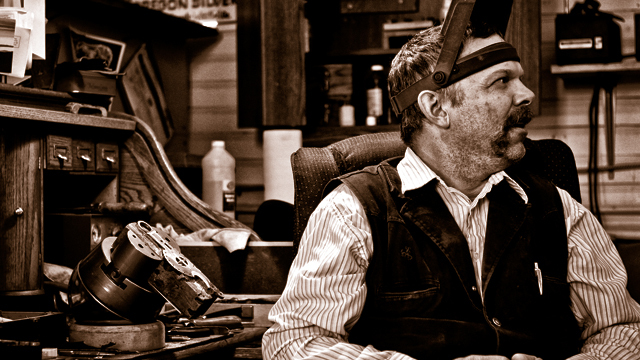 As much as Alderson values exposure to alternative and unfamiliar approaches to silversmithing, he places equal value on broadening the definition of “tradition” in cowboy crafts. He contends that it’s a willingness to experiment and to question—even break—longstanding rules that will allow western craftsmen to move their trades forward. 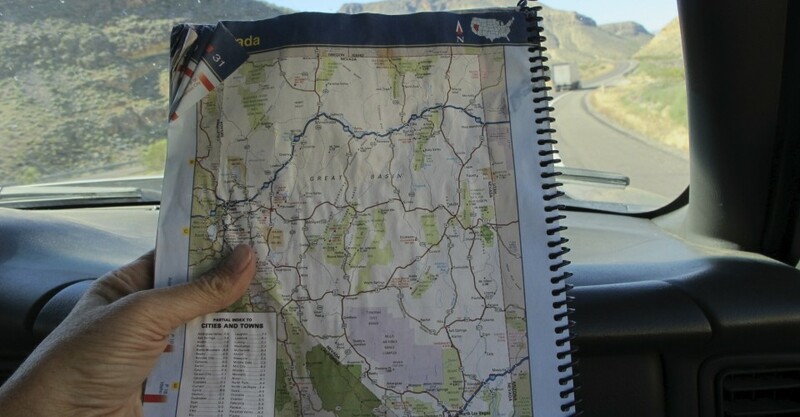 The premise might apply to adapting a technique used in another culture, one far removed from the Plains, Rocky Mountains and Great Basin, or to an effort at extending a final product’s appeal, fostering demand in the mainstream market. 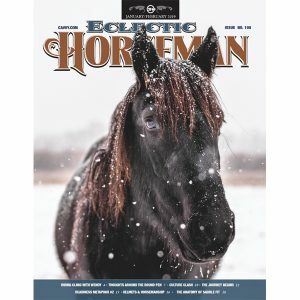 Regardless, as Alderson has demonstrated, forward progress in the cowboy crafts hinges on an artist’s ability to keep alive the curiosity that first sparked his creative urges, and on his willingness to shape a lifelong working philosophy around the premise of asking questions and seeking answers. Next articleWhere is Your Weight?